Not normally a mall rat, young Sammy Keyes somehow finds herself at the video arcade with her best friend one day, blowing off steam before the big junior-high softball tournament. Naturally, fans of this plucky girl detective will not be at all surprised to learn that this innocent outing winds up putting Sammy in the middle of another big, messy, dangerous mystery. In spite of her best intentions, our sleuth is soon exploring the seamy underbelly of her hometown, confronting gang members, pursuing a man with "hatred for eyes, steel for a mouth," and trying to take care of an abandoned infant -- all while remaining undercover at her grandmother's adults-only apartment complex. 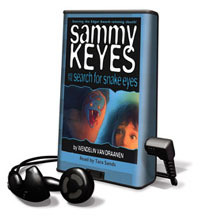 Newcomers and veterans of the Sammy Keyes mystery series will immediately take to this not-so-hard-boiled seventh-grade detective and her funny yet issue-laden adventures.